Discussion in 'Trek Tech' started by Stibbons, Jan 15, 2019. Hi all, new poster here (and apologies if this has come up before). 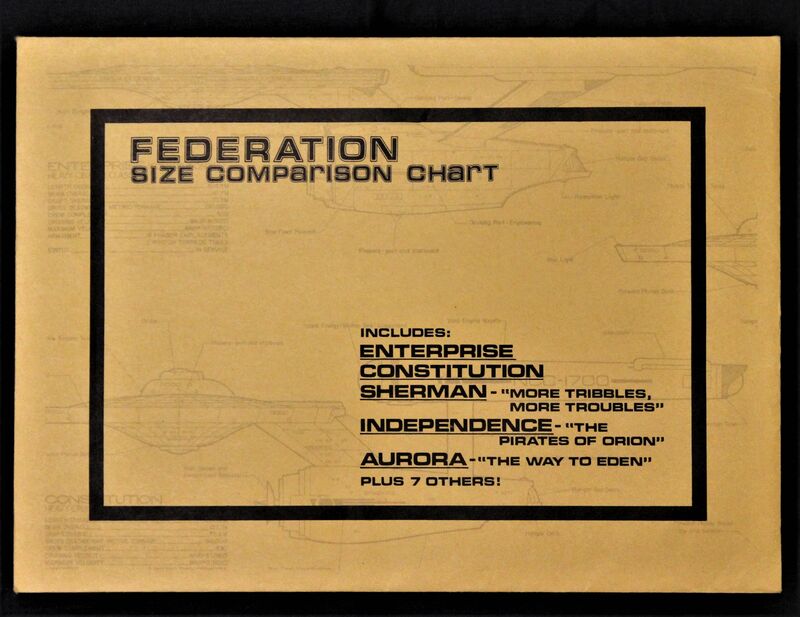 Recenty I got hold of a large collecton of the Starstation Aurora Federation Size Comparison Charts. 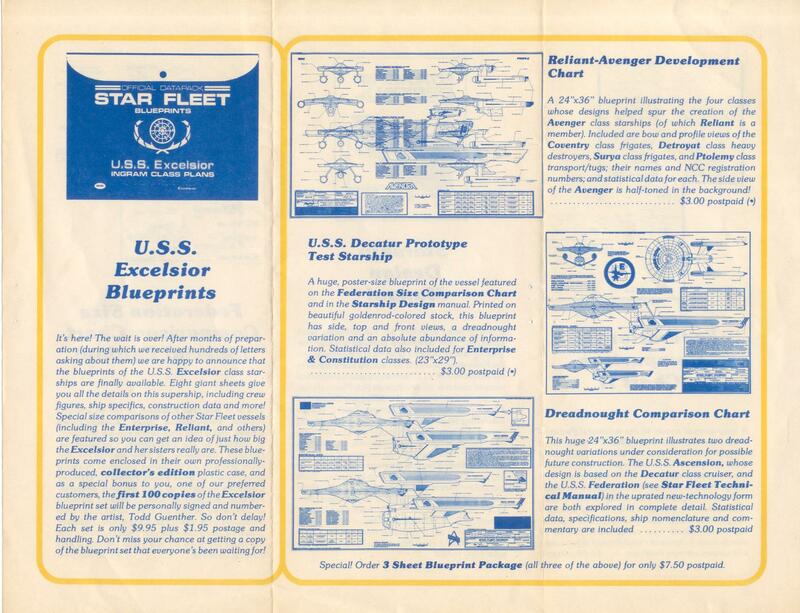 Now there are two on the Cygnus X-1 Starship Blueprint Database, and these were included, but there was another set of two and two more separate sheets as well. 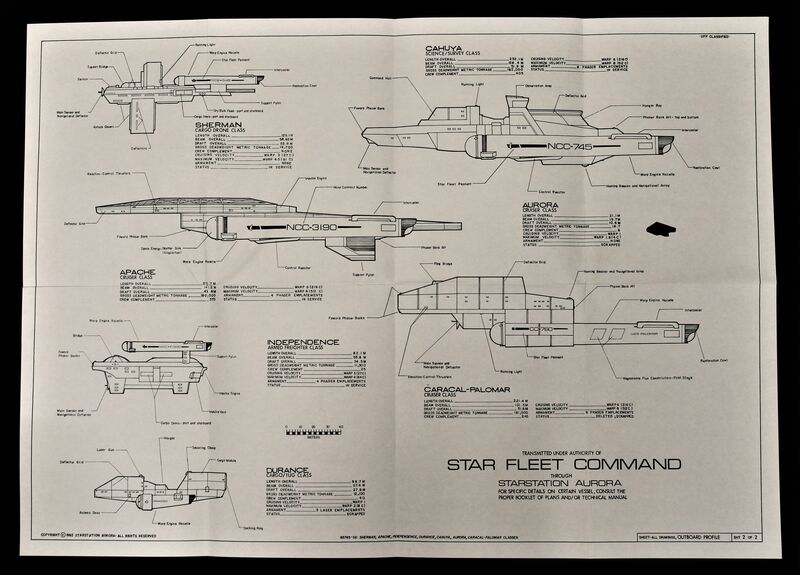 I've posted them up on the "Far Trek" RPG MeWe site here on my account as "Andrew Tucker"
Now I've never even heard of these before, and that second sheet in the first set has some REAL wierd ones like the Cahuya Science/Survey-class and the bizarre Apache Cruiser-class. Anyone ever seen these before and able to give me an idea of when they appeared. Now you should be able see these, trying Pinterest first, if that doesn't work I'll try another free hosting site. 137th Gebirg and trynda1701 like this. That is a fascinating blend of starship eras! The copyright date are on the sheets. 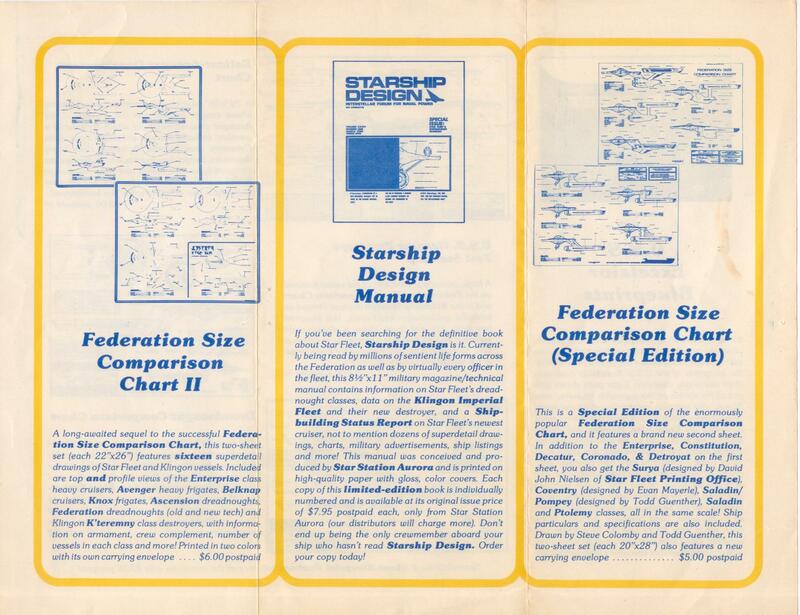 The ship comparison charts came in out in the 1980's I believe there are 2 different versions there was the original that had the ships that you refer to and the Special Edition chart which cygnus has posted. here's a catalog showing some of their material. Thanks for that. Got all those save the Dreadnought Comparison Chart. It's just that last sheet I posted up that had me wondering, that's not on this catalogue. It's 1982 dated and came in an envelope together with the first of those Special Edition sheets. Just never seen it before. A lot of that got put into book form around the time of Star Trek VI, and Generations. If I remember correctly the Version that you have could be ordered from Starstation Aurora from an ad in Starlog around copyright date. It predates the special edition. The catalog that I put up was a also printed much later. Yeah, I've got all of those and did order them from Starstation Aurora. Unfortunately, they stopped selling stuff back in the 90's and pretty much disappeared by the early 2000's. They used to set up a table at a lot of Trek conventions back then. I got several blueprint sets that way also. 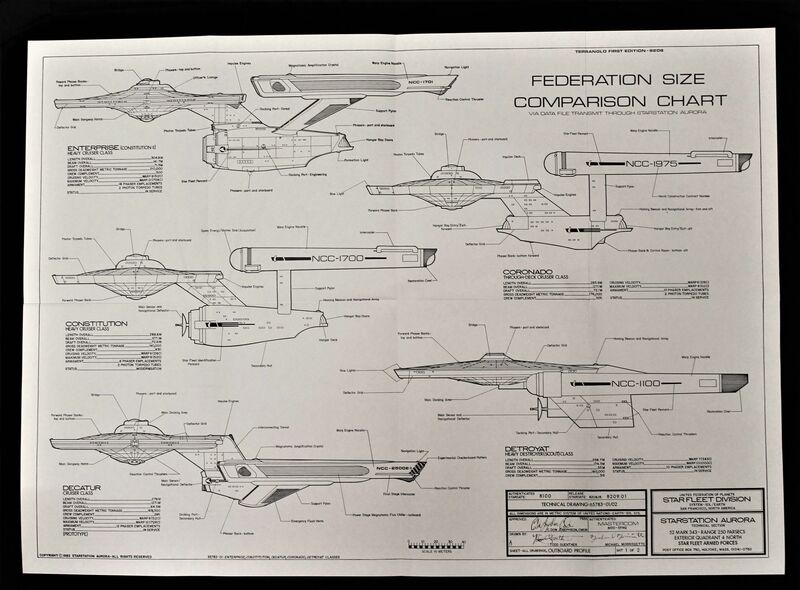 I've got a box of about 25 to 30 Trek blueprints tucked away that I started collecting waaay back when the very first USS ENTERPRISE ones came out in 1975. 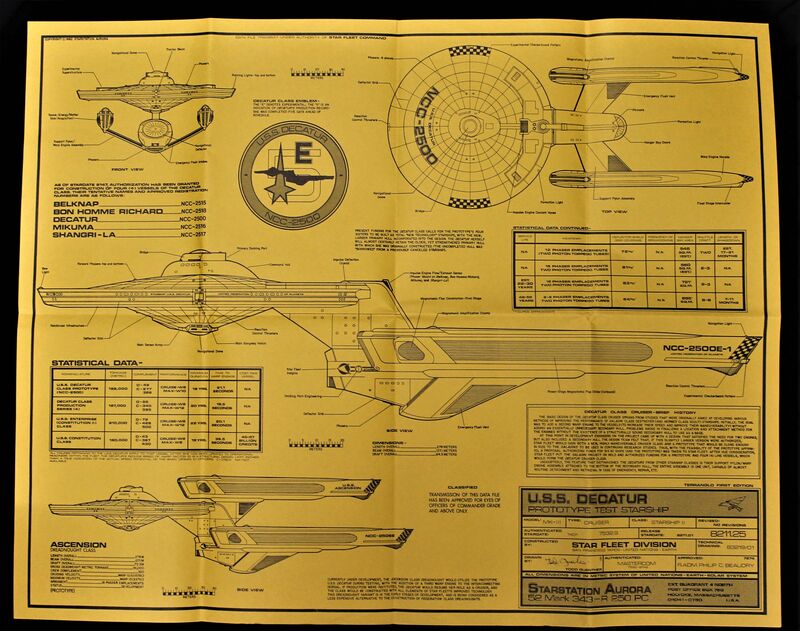 The "Special Edition" was the second release of those charts, the first release has the unusual second sheet with the Apache, etc. 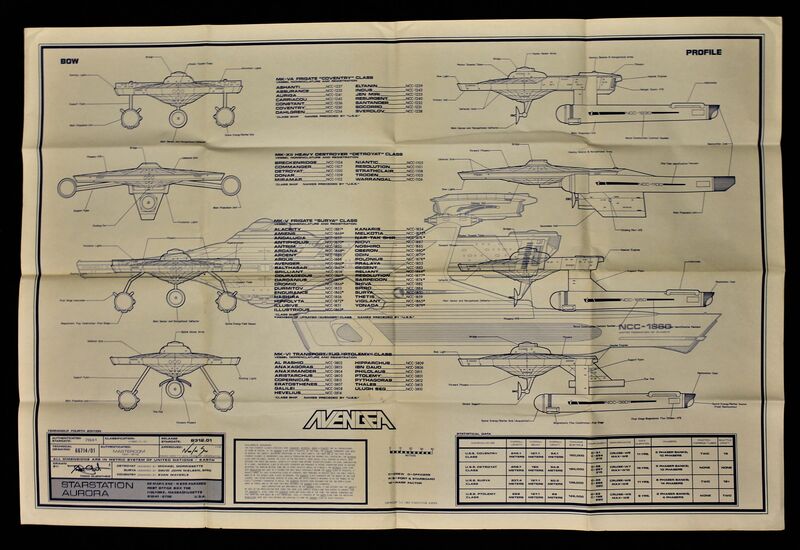 In the interim before the second version, Aurora had released newer blueprint sets of the ships now included on the new sheet #2, my assumption for the change is they they were more interested in promoting those as part of their ongoing Treknical universe. That seems to be the answer then, this is the first edition size comparison chart. Thanks all, I am better informed. [30 years later] No Todd Gunther did NOT design the Saladin/Pompeii!! Somewhere in the darkest reaches of the Universe! I'm surprised Franz Joseph wasn't credited in that list. Thanks for sharing these. I hadn't seen the Cahuya and Apache classes before. Plus, I knew that the Decatur was an amalgam of TOS/TOP tech, but I hadn't seen that prototype Ascension class Dreadnought with the same mix of the two techs. It's not the Pompeii (the city that got buried by Mt. Vesuvius), it's the Pompey (the Roman consul who waged civil war against Julius Caesar). Franz Joseph named the ships of the Saladin class after famous military leaders from antiquity. I believe the Pompeii error got started in Diane Carey's novel Dreadnought! DEWLine and King Daniel Beyond like this. Ah, and all this time i thought it a bizarre typo which withstood decades. Of course, Carey also gives a registry number for her Pompeii that is different from FJ's Pompey. So, different ships, and Carey's explicit one-naceller need not be Guenther's flat two-naceller, either. I have both of the comparison charts. I had the Decatur chart, but it got lost in a move. I never had the Avenger or Dreadnought sheets. These were all such great products. Hers, or the proofreader's insistence?